The Executive Director of the United Nations Environment Programme says its time to truly bank on the sun and the wind. 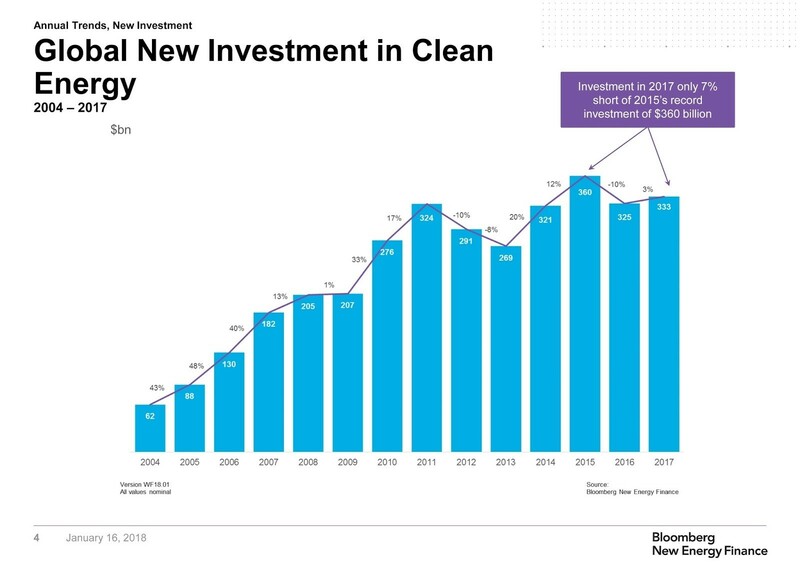 Just in case there was ever any doubt, it’s now crystal clear that clean, renewable energy is the future. The latest data shows a record quantity of new capacity added to the global grid last year, outstripping new fossil fuel plants and bringing the overall investment envelope to a whopping $2.9 trillion since 2004. For eight consecutive years, global investment in renewables have exceeded $200 billion, with a massive fall in renewables costs — particularly the tumbling price of solar panels – bringing increased bang for the buck. It’s share of the grid has doubled in a decade. There were plenty of stand-out stories too, all showing that the last-ditch defence of coal in the United States is not the new agenda. South Australia’s energy woes, consisting of black- and brown-outs and high electricity bills, spurred a proof-of-concept from Tesla who installed, in record time, the world’s biggest lithium battery. That has helped put to bed questions on whether solar was ready for the surge demands of a major grid. In China, the world’s first floating solar farm went on line, situated on a former coal mine – a symbolic placement that coincides with the long-awaited appearance of blue skies over Beijing. The devastating hurricane season in the Caribbean, meanwhile, ripped apart grids, but it has been solar that proved to be the most resilient. This sets the stage for a new kind of thinking in infrastructure development in vulnerable nations, where off-grid and micro-grid solutions are a model to be reckoned with when it comes to spurring the growth of inclusive economies that leapfrog the old-timers. Wind power in Germany and Denmark also smashed a fresh host of power generation records, with several days of truly remarkable overcapacity. It’s clear that wind and solar has come of age. Moving into 2018, the outlook is also bullish. The numbers have shown big jumps in renewable energy investments in places like Mexico (up 810%), and a very impressive 29-fold increase in investment in the United Arab Emirates. Saudi Arabia has meanwhile unveiled a planned solar power venture with Japan’s SoftBank – a mind-boggling $200 billion, 200GW scheme that is equivalent to two-thirds of all the existing solar worldwide. Even if a quarter of the panels see the light of day, it’ll transform the region’s energy landscape. All of this has happened at a pace that few thought possible even just a few years ago. In large part, these big numbers are thanks to China, which last year added 53 gigawatts of solar power, about half the world’s total. This growth has brought economies of scale, which in turn has pushed down prices, enabling other power-hungry nations – notably India – to embark on their own mega projects. Like the digital revolution, the rise of renewables has been one of those blink-and-you-might-miss-it moments. The train has left the station, the global markets have moved, and no amount of clinging to coal will turn things around. It’s worth pointing this out, as while the numbers show big jumps in the developing world, the developed world looks relatively sluggish and some quarters are still reluctant to make the jump. Furthermore, we need to recognise that the renewables sector is doing well in many places even without subsidies and on a far-from-level playing field against fossil fuels. It’s also a competitive proposition even without factoring in the so-called “positive externalities” of clean power. Things like fewer children with asthma, a healthier workforce, a better environment and quality of life. Add to that the data on jobs: we know, for example, that solar can easily create more jobs than fossil fuels per dollar invested. In addition, the jobs are generally better paid, better quality, with wider geographical distribution and better gender balance. There are now over 800,000 Americans who work in renewables, compared to 85,000 in coal. And finally, we cannot ignore the other benefits of unlimited energy from the wind or sun – greater global energy security and positive climate action that is built on growth, not cuts. To help make informed choices, the data and the success stories are out there. Still, the fact that renewables, when put together, are still a long way off from providing the majority of global electricity means that we still have a long way to go. The science is also telling us that while we’re moving in the right direction when it comes to getting off our carbon addiction and are at something of a pivotal moment, we need to get a move on. Happily, the markets have already made the decision, and the numbers show a healthy marketplace exists with or without subsidies. It’s now time for policymakers to ensure they are helping increase this momentum. The externalities need to be factored into the overall cost, as we know that healthcare and job creation do not come cheap. Vigorous innovation and investment must be facilitated and encouraged, not least so we continue to overcome issues like grid integration and storage but all the more so because the missing the boat is not economically viable. Potential rising costs or fluctuations in financing need to be ironed out. Renewables also deserve the chance to at the very least to compete on a level playing field, and that means bringing the subsidies and tariffs landscape up to date. In short, it’s time to truly bank on the sun and the wind. This article was written for The European Sting by Erik Solheim, Executive Director of United Nations Environment. The opinions expressed in this article belong to the writer. This article is published in collaboration with The European Sting.